1. In the bowl of an electric mixer, beat the cream cheese and peanut butter together until combined. 2. Add the graham cracker crumbs and beat for 10 seconds. 3. Add the sugar and butter, and mix on the lowest speed until it stops floating off everywhere, then increase the speed until the ingredients are combined. Scrape down the whole bowl well, then mix again. The mixture will be quite sturdy and a little dry — perfect for shaping. Set it aside while you prepare the coating. 1. Melt the chocolate either over a double boiler, stirring until it is completely smooth or in a microwave in 30 then 10 second increments, stirring before you start it again until it is completely smooth. 2. Let it cool to tepid (about 100 degrees) while you shape the peanut butter centers. 1. Line a sheet pan with parchment paper. Scoop out slightly more than one tablespoon’s worth of filling and use your hands to form it into a ball. 2. Place the ball on the prepared sheet and repeat the process until all of the candies have been shaped. They can sit close to each other but make sure they are not touching. 3. Using a fork or large skewer, dip each ball into the chocolate and roll it about so that almost the entire candy is coating, leaving a small circle uncoated. 4. Chill the buckeyes until they are set, about 30 minutes. 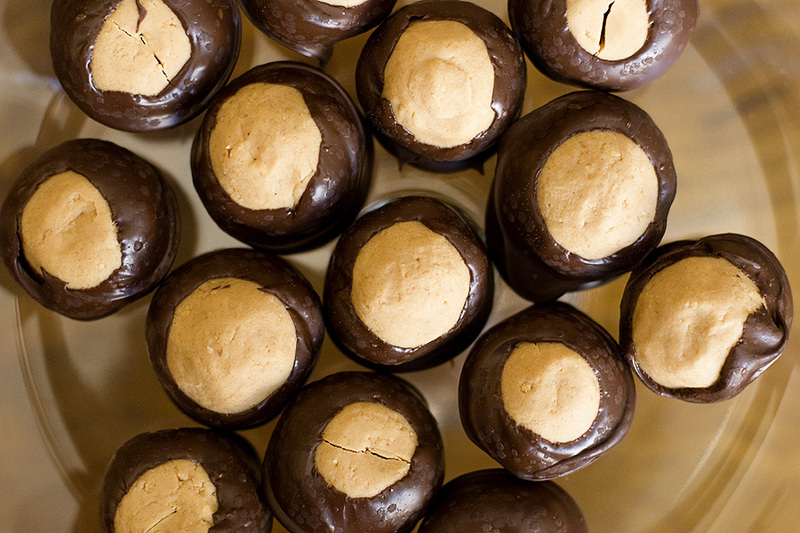 Buckeyes will keep in the fridge for about 3-4 days.